Watch out, vehicle is now cruising along city streets across Downtown. Late night streetcar test. Video by Warren Johnston. 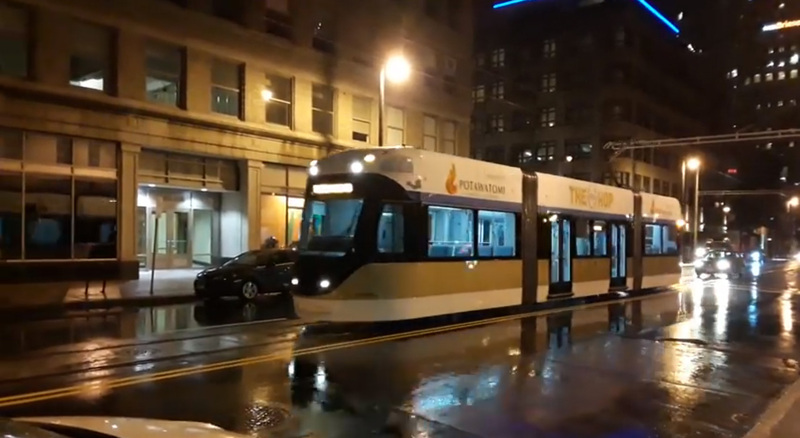 Without fanfare or protest, The Hop made its maiden voyage along much of the route Monday night marking a major milestone for the project. The vehicle was spotted running north on the 700 block of N. Milwaukee St. around midnight by My Office bartender and world traveler Warren Johnston. The late-night test was the first time the vehicle has run along the eastern leg of the route through the Historic Third Ward and into downtown’s East Town neighborhood. The Hop presented by Potawatomi Hotel & Casino, as the Milwaukee Streetcar is now branded, is undergoing testing as project general contractor Kiewit finishes work on the first phase of the route and contracted operator Transdev ramps up operations and maintenance hiring. Transdev, in partnership with the city, began testing the vehicle on a very short stretch of W. St. Paul Ave. in April after the first vehicle was delivered in late March by Brookville Equipment Corp. The tests, which have now expanded to the entire 2.2-mile first phase, will have vehicles running empty or with load-testing equipment until the system is ready to open to the public in late 2018. Before the public can ride The Hop, Transdev needs to hire operators, technicians and other system employees, and complete a federally-mandated 1,000 kilometers of testing throughout the route. The lakefront line expansion is scheduled to begin service in late 2019. Rides for the first year will be underwritten by Potawatomi as part of the casino’s $10-million, 12-year sponsorship deal. Additional expansion plans are already underway. The Common Council has approved an extension to the Wisconsin Entertainment and Sports Center and The Brewery, contingent on the city receiving a federal grant to cover 50 percent of the estimated $40 million. The city also recently released renderings on how the system would interact with the Walker’s Point and Bronzeville neighborhoods. This article will be updated as more information on the test becomes available. Possibly in conjunction with the wider testing of the vehicles, the city has scheduled the launch of a public safety campaign for the system known as Hop Smart for Tuesday. For more information on the project, see our nearly decade-long coverage of the project linked at the bottom of this article. In the words of a great patriot, “I don’t care do U? That streetcar is going at a really nice clip. Speed, coupled with timed intersection controls and strategic placement of stops (no more frequent than every 2 blocks, preferably every three) and we have a winner, here. I wonder how who “we” is. (Is that “we” the general population? Is “we” just those who ride it? Is that “we” the opinion of elected local and/or regional government?). And regardless how will it be determined when, if, and how it is fair to conclude whether it’s to be considered “a winner”. In my private sector career, we would set out goals (ranges usually) timetables, and the corresponding measures and processes by which to evaluate success. That, in turn, would drive decisions about pushing further ahead by investing more (time, effort, $$), about pulling the plug to minimize anticipated losses, and/or about just holding steady to allow more time for evaluation of trend lines. Are you aware of any such attempts to define and measure success? I am not, really, but I haven’t been digging into this very much. I am more of an interested bystander than I am of an assessor of progress and improvement, or lack thereof. Sorry, strike the word “how” in the first sentence. @ Gavin Eastsider, “We have a winner (, here).” is a common colloquialism. No need to over think it, brother. I’ve provided my criteria. Clearly, basically, speed and ease of getting somewhere else downtown. Consider The Hop similar to other downtown development initiatives like the Riverwalk or the strategies that led to the development of the Third Ward. For both of these, success, while difficult to set goals for or quantify, has been undeniable. If by-standing suits you, then have at it.